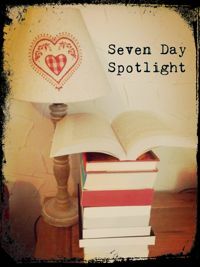 Welcome to this week’s seven day spotlight round up post. This week I went to my final three Off the Shelf events, after enjoying Lee Child and Sarah Winman over the last two weeks. First up was Richard Osman, who most of you will know as being the tall one from Pointless. His book is The World Cup of Everything in which he tries to settle such contentious issues as what is the nation’s favourite chocolate bar. He recreated this with the audience and the winner was Maltesers (I have to agree as I love Maltesers). The book would be absolutely perfect for Christmas Day debates with the family. Cheesy Wotsits or Quavers anyone? 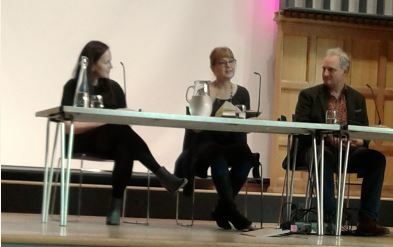 I also went to the It’s All A Fiction readers afternoon. 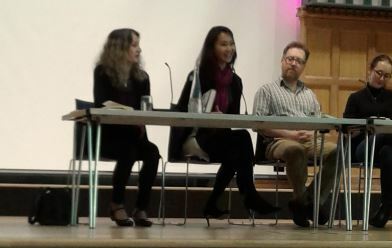 This is a popular event in the Off the Shelf festival and this year we were treated to seven, yes seven, authors. First up were Lesley Downer, who featured on Short Book and Scribes here, and who talked about The Shogun’s Queen, Felicia Yap who talked about her book, Yesterday, Gregory Norminton with his collection of short stories, The Ghost Who Bled, and Fran Cooper with These Dividing Walls. All four read from their books and answered questions from the host, Trisha Cooper from BBC Radio Sheffield. The second half, after refreshments, saw Hannah Kohler, author of The Outside Lands, Lesley Glaister with her book, The Squeeze, and Stephen May with his book, Stronger Than Skin, take to the stage. Again they read from their books and answered questions. What was also nice about both sets of authors was that they asked each other questions and interacted really well with each other. It was a great afternoon and a favourite event for me in the Off the Shelf programme. 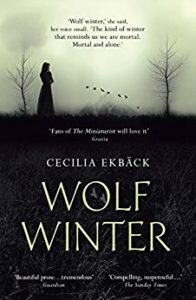 Everybody who attended was treated to a free book and I chose Wolf Winter by Cecilia Ekbäck. It was also my great pleasure to meet up with lovely fellow blogger, Adele from Kraftireader. The final event was with Stephen McGann, well known as Dr Turner in Call the Midwife. 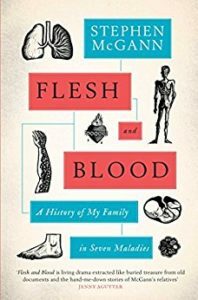 He spoke in such detail and with such enthusiasm about his book, Flesh and Blood: A History of My Family in Seven Maladies. It sounds like a fascinating read which covers the slums in Liverpool, the Irish Potato Famine, right up to Stephen’s mother’s lifelong distress after losing twins and his own problems with agoraphobia. After hearing him speak I was tempted into buying the book and getting it signed and I was lucky enough to have my picture taken with such a lovely, friendly man. And that’s my Off the Shelf over for another year. I love the festival and look forward to it every year. If you live anywhere near to Sheffield then I wholeheartedly recommend it. On Monday I hosted an interview with Wendy Percival, author of the Esme Quentin genealogical mysteries. 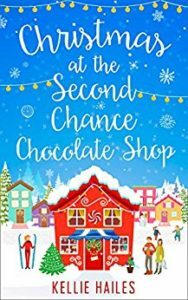 Tuesday saw me sharing Kate Hewitt’s five favourite things about Christmas as part of the blog tour for The Vicarage Christmas. If you’re quick you could still enter the giveaway on that post. On Wednesday I had a guest post from Jen Waldo about her love of words as part of the promotion for Why Stuff Matters. I also celebrated my one year blogiversary and my giveaway is still running for a couple more days if you would like to enter. I’ve been overwhelmed by all the lovely comments on that post. On Thursday I reviewed the heartbreaking book, Tin Man, by Sarah Winman. Friday saw me taking part in the blog tour for The Winter’s Child by Cassandra Parkin with a review and an interview with Cassandra. On Saturday I posted my review of The Forgotten Room by Ann Troup as part of the weekend blog blitz. And finally today I posted my review of Lilly Bartlett’s novella, Christmas at the Falling Down Guesthouse. Phew, I think I’ve tired myself out this week! So what have I added to my TBR pile this week then? 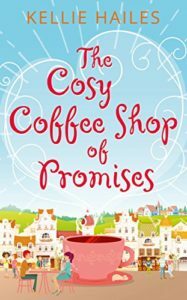 The Cosy Coffee Shop of Promises by Kellie Hailes – this one and the one below are the other two books in the Rabbit’s Leap series. I reviewed the middle one, The Big Little Festival, last week. Mel’s dream of opening a coffee shop is finally a reality! A cosy little place turning out the best flat whites and most delicious pastries in Devon. In the picture-perfect town of Rabbit’s Leap no one can stand in her way – especially local pub owner, Tony. She doesn’t care how gorgeous he is, she will not let him steal her customers with his fancy new coffee machine! 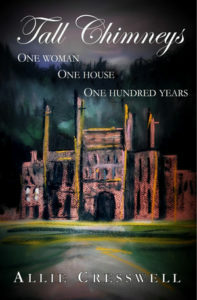 Tall Chimneys by Allie Cresswell – no Amazon link for this yet. I love books about stately homes. Yes by Anne Patterson – I saw this on Linda’s Book Bag and really liked the sound of it. Maureen McCormack wakes up in hospital after a stroke. Her memory is fragmented and she can say only one word – yes. Friends, family and lovers visit her, filling silences with secrets and learning to open up as Maureen learns to listen. As the revelations mount, she and those around her attempt to come to terms with all that has been left unsaid and unexamined, and her view of life shifts fundamentally. When Maureen’s ability to speak returns she decides to keep it a secret until she has made sense of her past and gathered the strength to shape her future. 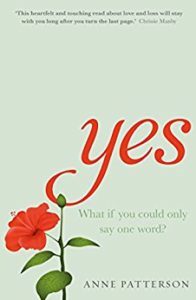 Yes is a captivating novel about how relationships grow, disintegrate and heal, showing what happens when people really listen to each other. 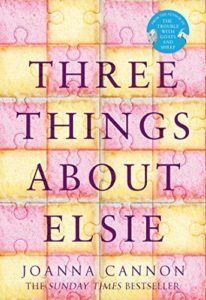 Three Things About Elsie by Joanna Cannon – a highly anticipated read for me as I loved The Trouble With Goats and Sheep. There are six homesteads on Blackasen Mountain. A day’s journey away lies the empty town. It comes to life just once, in winter, when the Church summons her people through the snows. Then, even the oldest enemies will gather. But now it is summer, and new settlers are come. It is their two young daughters who find the dead man, not half an hour’s walk from their cottage. The father is away. And whether stubborn, or stupid, or scared for her girls, the mother will not let it rest. digging at the secrets of the mountain. So that’s all for this week, folks. I’d love to hear any thoughts or comments. 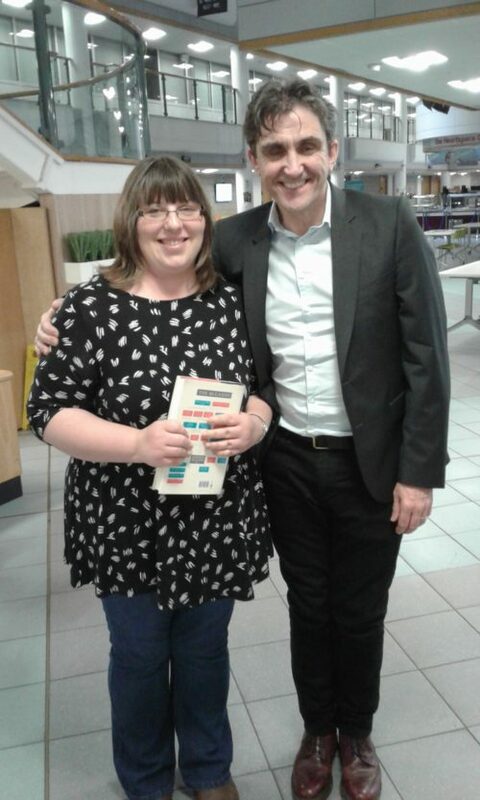 Stephen McGann’s book is brilliant and he is lovely isn’t he? Glad it’s good, Joanne. I knew I wouldn’t be able to resist once he started talking about it. He is such a lovely person. Very tempted by Tall Chimneys and I like the sound of Wolf Winter as well. What a great write up about your enjoyment of Off the Shelf. I was so pleased to share one of these events with you and to meet you. Hope to catch up with you again soon.